Shenzhen, China – Beike Biotechnology has been granted AABB accreditation for cord blood processing, storage, distribution, cell therapy activity (MSC, cord blood; MSC, placenta; NC, whole blood), somatic cell processing, storage, and distribution at the Shenzhen integrated cell bank according to Dr. Jay E. Menitove, president of AABB. This confirmation follows the announcement of preparation for AABB accreditation by Beike Biotechnology from earlier this year, and is now Beike’s second AABB accredited facility. The AABB Accreditation program has been recognized by the International Society for Quality in Healthcare (ISQua). In June 1995, AABB was granted “deemed status” as an accrediting organization under the clinical Laboratory Improvement Amendments of 1998 (CLIA ‘ 88) program. This granting of “deemed status” indicates that the Canters for Medicare and Medicaid (CMS) has found the AABB accreditation process to provide reasonable assurance that the facilities accredited by it meet or exceed the conditions required by federal law and regulations. Established in 1947, AABB (formerly known as the American Association of Blood Bank) is an international, not-for-profit association dedicated to the advancement of science and the practice of transfusion medicine and related biological therapies. The association is committed to improving health by developing and delivering standards, accreditation and educational programs and services to optimize patient and donor care and safety. 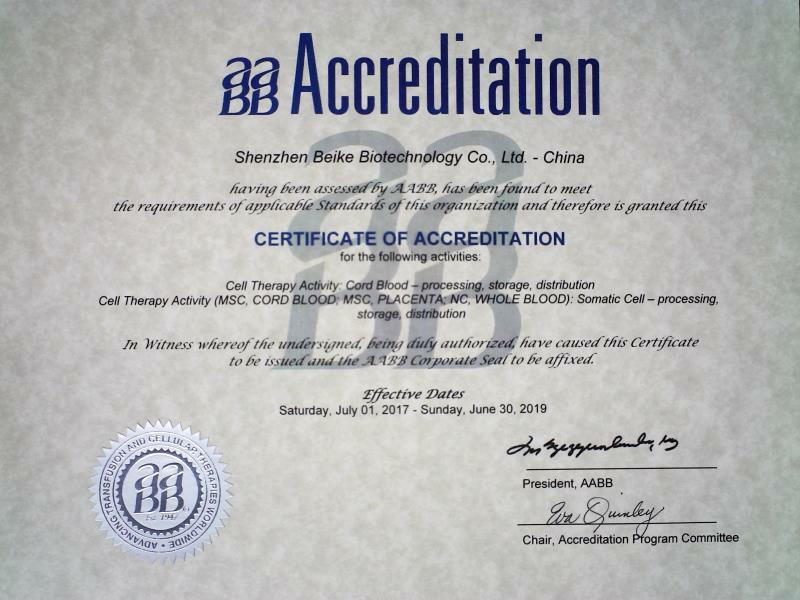 About Beike Biotechnology Co., Ltd.
Beike Biotechnology Co., Ltd. (https://beikebiotech.com/) is the world’s largest stem cell provider and China’s leading cellular therapy company focusing on research, cell banking, and the production of adult stem cells and immunotherapies for medical use. Headquartered in Shenzhen (near Hong Kong), Beike has been committed to advancing cellular therapy since 2005.